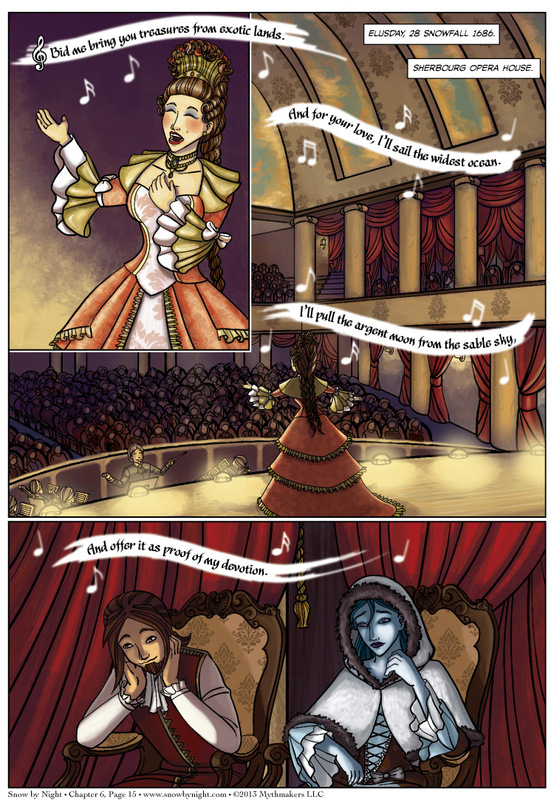 It’s a night at the opera on Chapter 6 Page 15. Brittany and Naty outdid themselves bringing an art form that is the height of baroque culture to the page. A couple faces we haven’t seen in a while are appearing on the next page. Vote for Snow by Night on Top Web Comics to get a peek at who they are. Congratulations to Laura Hollingsworth! She is the winner of our 2013 Art Contest. She emerged the victor from the championship round against Amasugiru, who is our second place winner. I’ll be in touch this week to discuss your prizes. You two certainly deserve them. Great work! My thanks to all of our entrants. 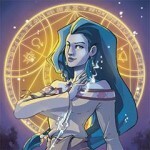 I was impressed by every submission and am honored that you spend so much time and talent illustrating our characters. Thank you so much. All the submissions will be going on our Extras page on Wednesday. Diane has finished the last of the chibis for us. Lovely Liaze joins the chibi team with an invitation to shop at our Store. You can find it at the top of the page where the Art Contest banner link was. We have a sale going on now. Buy all the books of Volume 1 and the last book is half off. It is interesting that the lyrics seem to mirror her quest. Nice touch there. Hmm… That look on Snow-By-Night… It looks like she’s both enjoying the show and being uncomfortable. I guess those clothes can get pretty hot indoors. Two of my favorite things in one place: Snow By Night and opera. Makes a rainy, dreary Monday a whole lot brighter! Brittany did a great job illustrating Snow-by-Night’s reaction to the opera. They make a surprisingly-cute couple. I’d never have guessed Blaise to enjoy such refined entertainment though; yay for discovering new dimensions in characters! Just wait for the next page. Blaise expresses his refined opinion of opera.